Ring resonators are circular waveguides that are used as optical cavities. They look like tiny racetracks and are often fabricated from silicon. Photons can enter and exit a resonator and even move to neighboring waveguides through evanescent coupling. The micro-rings only let light waves circulate-- “resonate”-- if they have the right wavelength (the circumference of the ring equaling an integer number of wavelengths). For an off-resonance condition less light will inhabit the ring. 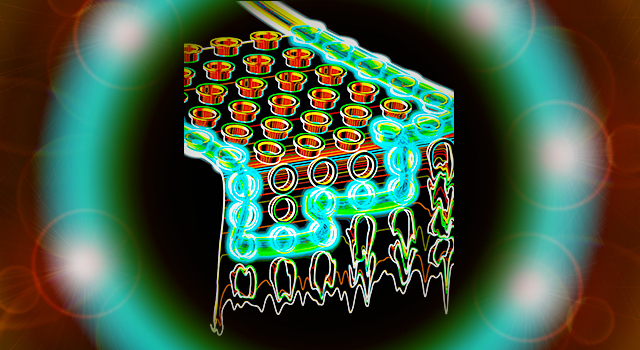 This image, featured on the cover of the December 2013 issue of Nature Photonics, depicts an array of ring resonators designed to be a photonic analog to electrons experiencing quantum Hall physics. Read more to learn more about these micro-racetracks. Coaxing light to behave like electrons is important for hybridizing photonic devices with existing electronics. Straight optical waveguides (like fiber) are the photonic analog of current carrying wire. Because of the circulation restrictions, resonators act as good filters, another element for information processing. In general, miniaturizing optical elements to a scale comparable to their electronic counterparts remains challenging. A recent result harnesses micro-resonators to create the photonic version of a material system that exhibits the electronic quantum Hall effect. This technology potentially could be used to miniaturize optical delay lines. This team built a structure to guide infrared light over the surface of a room temperature, silicon-on-insulator chip. Amazingly, they directly observed light racing around the boundary, impervious to defects. These photonic “edge states” are directly analogous to the quantum Hall effect for electrons. Briefly, a magnetic interaction is key for realizing quantum Hall states. The question here to ask is how researchers can design a material where photons---massless, charge-free, packets of energy--- flow as if they are being manipulated by a super-strong magnet. The secret is in the design of the resonator lattice, which determines the criteria for light hopping along the edge of the array rather than through the bulk/central region. The photons pile into an edge state only when the light has a particular color. A neat feature: along these ring resonator edge highways photons will skirt around defects, unimpeded. They cannot do a U-turn upon encountering a defect because they do not have the appropriate light frequency, which is their ticket to enter the backwards-moving path. What else can ring resonators be used for? One example is sensors: scientists can detect changes in the cavity resonance, caused by nearby objects like molecules.